Masonic degrees are stages or levels of membership within the organization. Each Blue Lodge (also call Craft Lodge or Symbolic Lodge) is the starting point for each Mason as they begin their journey through the various degrees of the brotherhood of the Freemasons. 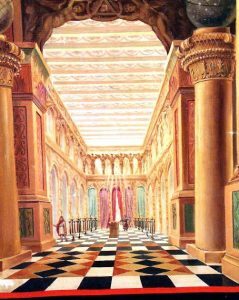 Within each Lodge, the members are engaged in the teaching and performance of allegoric ritual that allows the men to pass through the first three Masonic degrees. The first of the Masonic degrees is the Entered Apprentice. This degree is representative of youth and is a period of intense learning. This is the level that makes a man a Mason and is viewed as the initiate stage of his membership. In this degree he is welcomed into the brotherhood and is entrusted with the secrets of the order and is prepared for earning the higher degrees. The second Masonic degree is the Fellow Craft. This degree is representative of adult life and is the time for increased learning and work. Within this level, the Mason is seen as a follower and an associate, not a servant or subject. This is the intermediate of the three basic degrees of Freemasonry. The third degree in the Masonic structure is the Master Mason. This is the highest degree that can be earned and is representative of mature life and ripened experiences. In this stage, the Mason continues his activities but is expected to decrease his labor. Because he has reached the highest degree, a Mason of this level is seen to have higher responsibilities within the organization. At this degree, the Mason is thought to realize the truth of the immortality of man, and having been faithful to all of his Trusts, he will eventually die and receive the reward for this fidelity. After a man has achieved the third Masonic degree, he can continue his studies through the Scottish Rite or York Rite. Earning degrees through these organizations does not give him higher rank within the brotherhood, but simply allows him to continue with the teachings. In the United States, the Scottish Rite is divided into Northern and Southern jurisdictions. They are similar, but occasionally have different names for the different degrees. In the Scottish Rite, there are three levels within which degrees are earned. The first is called the Lodge of Perfection and the member can earn degree numbers 4 through 14. Degrees 15 and 16 are earned within the Council, Princes of Jerusalem and 17 and 18 are earned through the Chapter of Rose Croix. In the Consistory, the member can earn degrees 19 through 32, with the 33rd degreed being awarded for Honorary Achievement, also called the Degree of Soverign Grand Inspector General. This degree is awarded annually to certain 32nd degree Masons who have exemplified Masonic principals in their daily life.